This unusual clock has a battery operated movement and has a large 45cm diameter (17¾ inches) sweep radius giving a total diameter of 90cm (35½ inches approx). The mechanics and power souce are contained within the hub which will allow fixing to any flat surface. It can be used on a plain wall to provide style and sophistication, but for a really dramatic effect try combining with a wall mural or even a plaster relief. 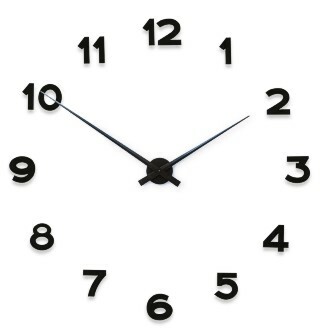 Clock can be used on its own or with bars or numbers (available separately).